Joint tissue (cartilage, ligaments, joint capsule) are created by nature for large loads. The strength of joint tissues is achieved, in particular, very little content of the blood vessels. This means that the blood circulation and metabolism in the tissues of the joint are very slow. Therefore, cartilage, ligaments and joints capsules are very sensitive to metabolic disorders: they can deposit harmful metabolic products (salts, acids, proteins, fat), with a shortage of nutrients joint tissues may atrophy and disintegrate. The prefix “it” in medical terminology means inflammation of something: arthritis – joint inflammation, polyarthritis – inflammation of the large number of joints for one reason; periarthritis – inflammation of the tissues around, synovitis – inflammation of the membrane lining the joint cavity, tendonitis, tenosynovitis – inflammation of the tendon and tendinous bags. The cause of arthritis can be aggression of own immunity for joint tissue (reactive arthritis, rheumatoid arthritis, ankylosing spondylitis, psoriatic arthritis, rheumatism), metabolic disorders (gout), joint overloading with its long damage, infectious inflammation of the penetration of germs into the joint through damaged skin in a lowered immunity. 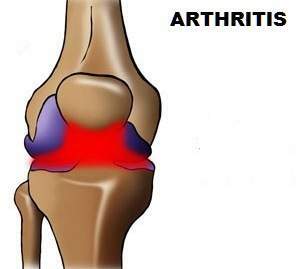 Osteoarthrosis is premature aging and the gradual destruction of joint tissue. Joint cartilage becomes thin and brittle. Bearing surfaces of the joint lose the ability to slip. Ligaments become less flexible and durable. In the joint tissues, with osteoarthrosis, appear microscopic tears, and then there are deposited the calcium salt in the damaged areas. The joint is deformed, in the result – the pain, inflammation and limited mobility. There are different types of osteoarthrosis: Coxarthrosis – osteoarthritis of the hip; Gonarthrosis – osteoarthritis of the knee; Osteoarthrosis – osteoarthritis many joints, low back pain – a similar of osteoarthrosis process of the spine. Frequent causes: metabolic disorders (diabetes, arteriosclerosis, diseases of the thyroid gland), overloading of the joint (sports, professional load), obesity, trauma, inflammation of the joints ( arthritis ). Deformation of the joint may be noticeable visually or only on radiographs. Deformation can be prevented or slowed down, if it is detected early. The pain may be aggravated by movement, as well as at night (in the morning). The pain is often related to the pressure on the nerves, routes running through the area of the joint. It is easy to check up by sensory disturbances or using electromyography. The pain responds well to topical treatment (physiotherapy, compresses). Crunch, friction noise and clicks, violation of mobility in the joints also is a manifestation of the deformation of the articular surfaces, low elasticity of the joint capsule and ligaments. Chronic diseases of the joints and spine treatment goal – to enhance the metabolism in tissues of the joint, remove the inflammation, swelling, provide the regenerative (restoring) action, to anesthetize the entire process. Physical therapy and, in particular, the magnetic field goes places. When exposed to magnetic pulses in the joint and surrounding tissue is activated circulation. Against this background, improving food joint, accelerates the removal of harmful products. As the result – dissipates swelling, relieves inflammation. How it’s manifested externally? Firstly, developing an anesthetic effect, then swollen, immobile joints receiving normal size, becomes mobile. Analgesic effect of magnetic therapy is based on the fact that the magnetic pulses act on the nerves that conduct pain signals to the brain. The magnetic field is “loose”, slows and weakens the hold of the pain impulse to the nerve; the impulse fades, without reaching the brain. Very important also is that by increasing local blood flow magnet enhances the therapeutic effect of taken on its background medications that can reduce their dose, and accordingly, the number of side effects. In terms of reducing and eliminating pain, restoring joint, eliminating inflammation, excellent reputation has MAGOFON device (pulsed magnetic field + acoustic) and ALMAG-01 (travelling pulsed magnetic field.) The fastest and qualitative results provided by the modern machines of the latest generation – POLIMAG-2 and ALMAG-2.